It was supposed to be just a television show. Then after millions of records were sold, people said The Monkees were still just a shooting star from the Sixties soon to be relegated to the nostalgia scrap heap. Oh how those people were wrong. Yet nearly 50 years after the show about “an imaginary band” first aired in 1966, the three surviving members of The Monkees are not just going strong, but still bringing their timeless tunes to the masses, with New York getting a dose of the trio at The Paramount in Huntington this Sunday, May 25. And while the group’s appeal doesn’t surprise Micky Dolenz anymore, when he got his first dose of the revival of Monkeemania back in 1986 thanks to MTV, it did come as a bit of a shock. 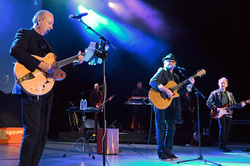 Dolenz, Michael Nesmith, and Peter Tork are now making the rounds for a spring tour that began tonight in Hampton, New Hampshire and that will take them through to Cleveland on June 7. It’s not a Rolling Stones-esque production, just three pals getting together to run through songs that not just capture a time in so many people’s lives, but that still sound fresh today. Davy Jones, the heartthrob of practically every teenage girl back in the Monkees heyday, and the lead vocalist on the classic “Daydream Believer,” passed away in February of 2012 at the age of 66. Seeing The Monkees without him takes a bit of getting used to, but Dolenz and company have found a way to keep his presence alive during gigs. That’s how the surviving Monkees make it work, and to do so after all these years is an impressive feat. So what’s the secret to their appeal, not just to the folks that grew up listening to them, but to a newer generation that may have discovered them during MTV’s reruns of the show or through their parents? But few have done it like The Monkees. And Dolenz appreciates that what was once a television creation has turned into so much more.